Since 2012, we have had a return to Alaska on our to-do list. That was the year we found and planted letterboxes in all the 48 contiguous states. 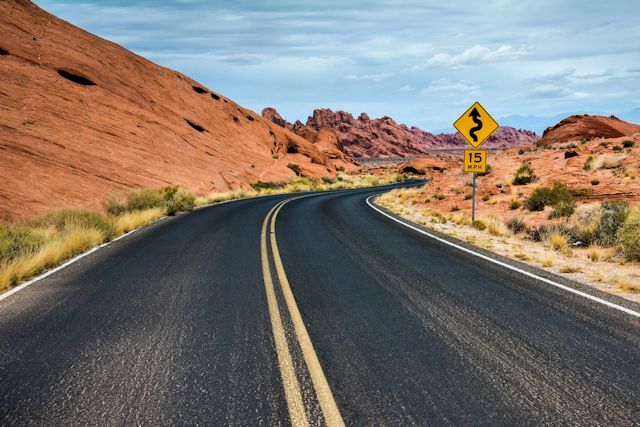 In 2014, on the way back from New Zealand, we added Hawaii to our list of F and P states. Wrapping up this goal with a visit to Alaska was several years overdue. Our plans call for overnight stops in nine cities from Ketchikan in the far south to Barrow on the northern coast. During the course of 18 days, we'll definitely plant and find some letterboxes and explore some of the natural wonders and cultural history of this gargantuan state. 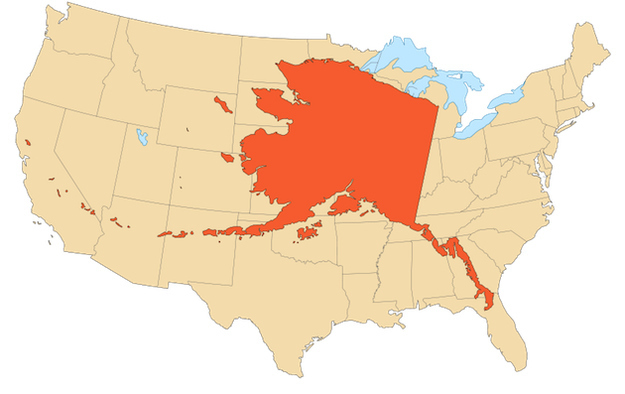 How big is Alaska? Its total area is equivalent to one-fifth the territory of the lower 48 states. When all its islands are included, it's actually wider than the lower 48. If Alaska were a country, it would rank 33rd in size out of the world's 239. Nearly two-thirds of all National Park lands in the U.S. are in Alaska. 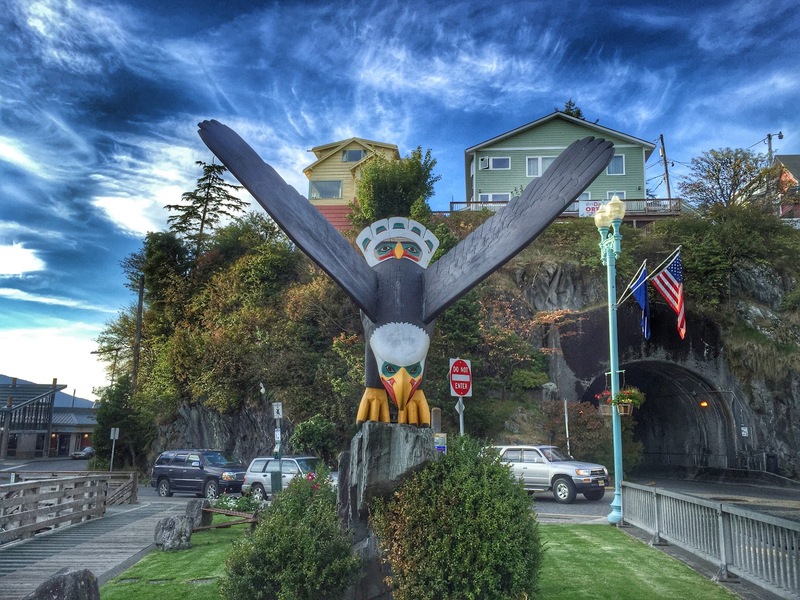 The westernmost town in the U.S. is not in Hawaii, as one might expect. It's on an Alaskan island. The Alaska tourism web site has a fun page called How Big Is Alaska which allows one to compare it to any of the other 49 states. Ketchikan is famous for its historic Creek Street but today most streets are asphalt. 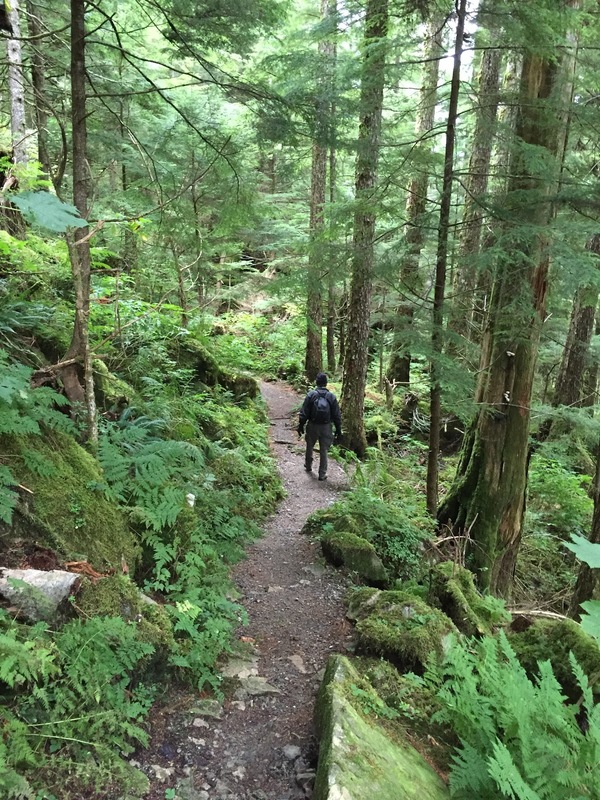 Our exploration of this vast land began in the south with Ketchikan (pop. 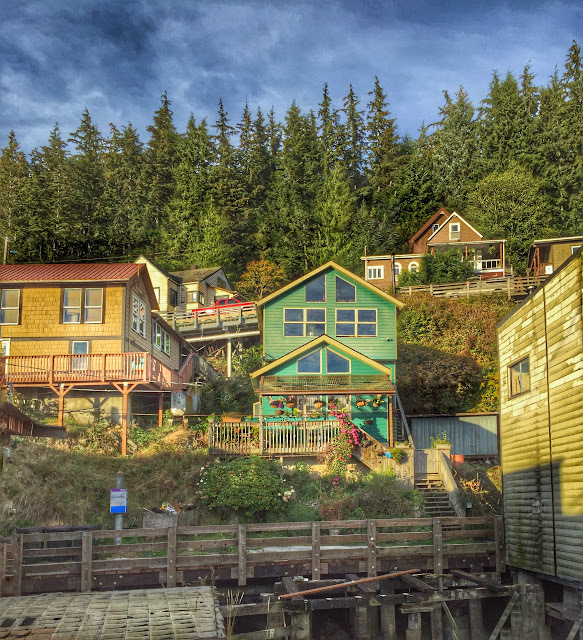 8,214), the first gem on the string of islands that make up the very popular Inside Passage cruise ship route. Our arrival, however, was not by sea but by Alaska Airlines from Seattle, where Delta had ferried us from Atlanta. 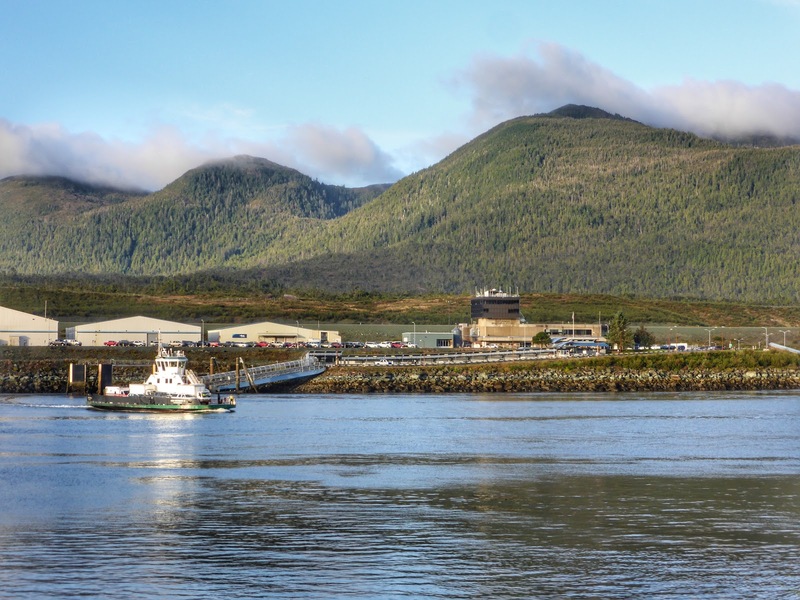 Ketchikan's airport is located on Gravina Island, across a 1,000-ft span of the Tongass Narrows. 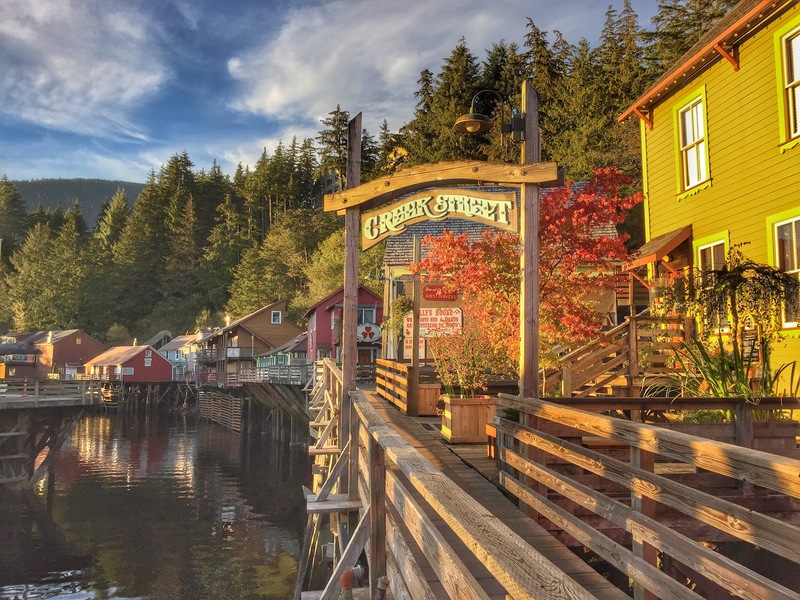 Back in 2005, Ketchikan became the poster child for profligate pork barrel spending when the Alaska Congressional delegation pushed through earmarked funding for a bridge to connect the city to Gravina Island, the notorious "Bridge to Nowhere." A total of $400 million was allocated. 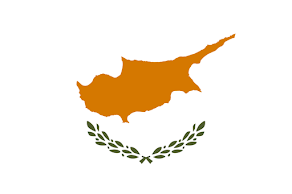 For a simple bridge across a narrow strait? Well, yes; it's complicated. The bridge had to permit the passage of massive cruise ships more than 200 feet tall. So to span a 1,000-foot distance at a practical grade, the bridge would need to be almost two miles long. Surely by the time a vehicle accessed the distant ends to go from one shoreline to the other a fifth of a mile away, it could have been there several times on the five-minute ferry that conveniently transports vehicles across throughout the day. 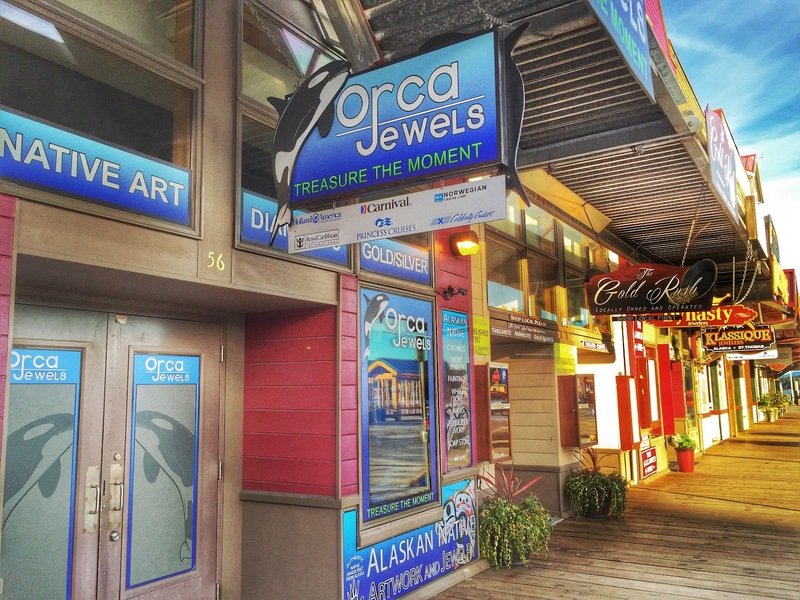 Ketchikan's colorful shops and restaurants shutter their doors when the cruise ships sail away. Ketchikan has all the hallmarks of a successful cruise ship port of call, with five berths along its main street, Tongass Highway. At the height of the summer cruise season, as many as 10,000 passengers per day alight to visit the quirky Creek Street historic section and the dozens of gift and souvenir shops that line the streets. Like Skagway, Ketchikan hosts a plethora of gem and jewelry shops. Perhaps cruise passengers are instinctively attracted to shiny objects. At any rate, the partnership between the town and the cruise lines seems to be a successful one. 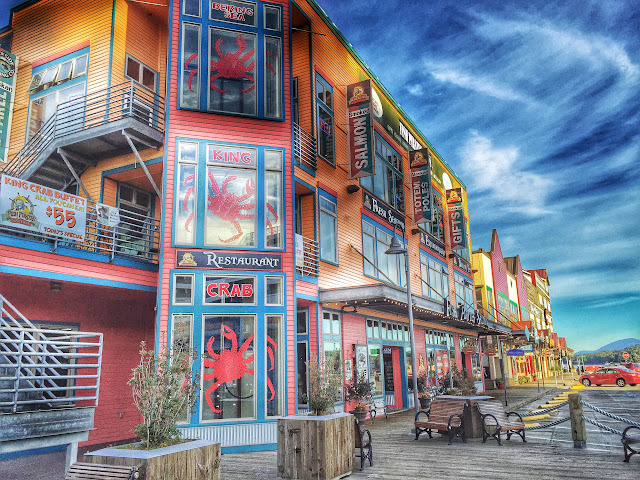 But what we found most appealing about Ketchikan were its natural gems, not the flashy ones. 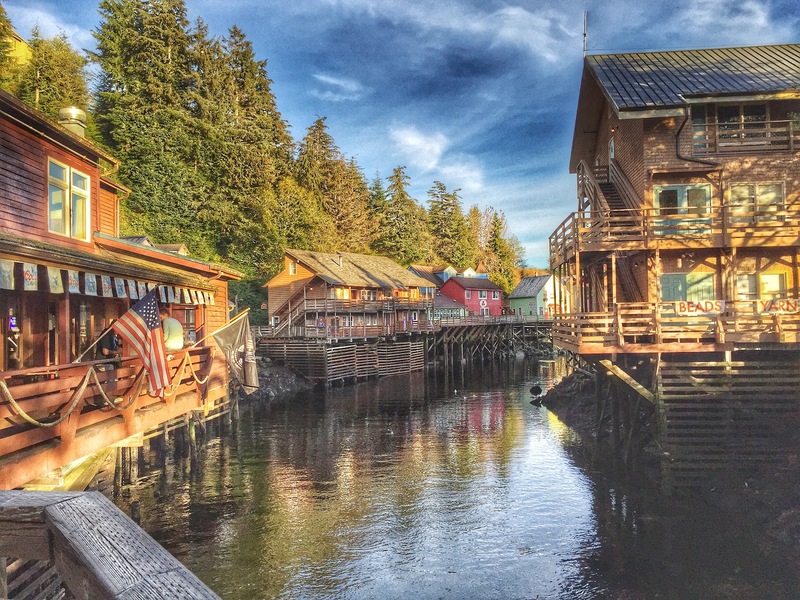 With its mild, maritime climate, Ketchikan has moderate temperatures year round. Its signature climate feature is rain—and lots of it, explaining why the local tourist bureau promotes the town as "America's Rainiest City." 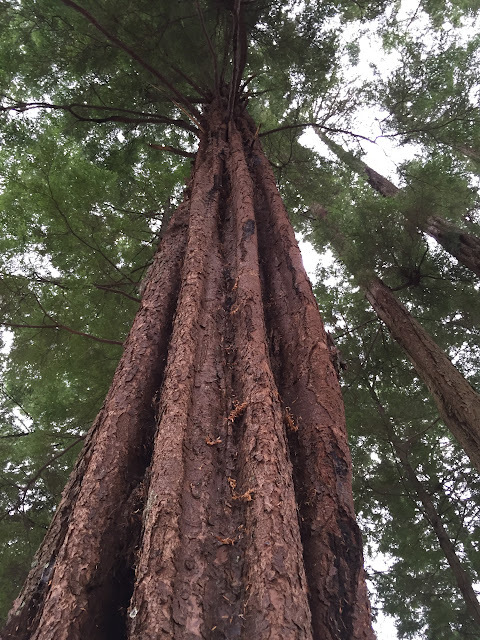 Cue the story of a tourist asking a local child, "How long has it been raining, son?" "I don't know, sir," came the reply. "I'm only five years old." 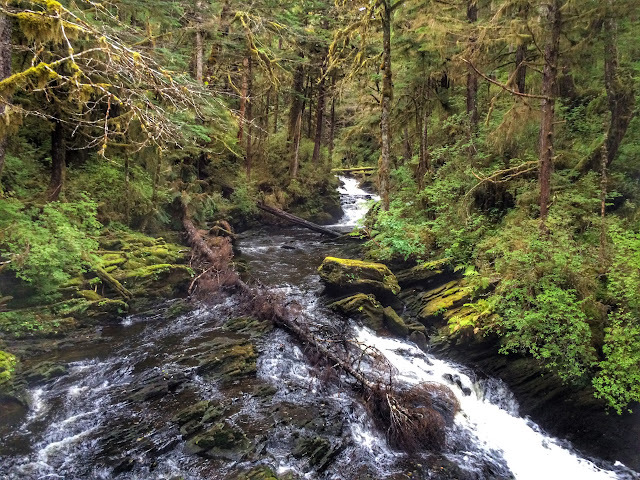 As in Washington state, the steady flow of rain has created a lush temperate rain forest along the southeast Alaska coast. And on Ketchikan's compact island home, the state has carved out some particularly spectacular natural areas to preserve for public use and enjoyment. Catch a natural star and put it in a pocket...park. Three such small parks around Ketchikan definitely rise to the stellar level, and only one was promoted in tourist brochures. Stretching a half mile along the beach, this remarkable little 13-acre shoreline park is given barely a passing mention on the Alaska DNR web site and no promotion elsewhere. Not a single word on the town's list of "can't miss attractions." Yet this diminutive jewel is a treasure trove of massive tree specimens. 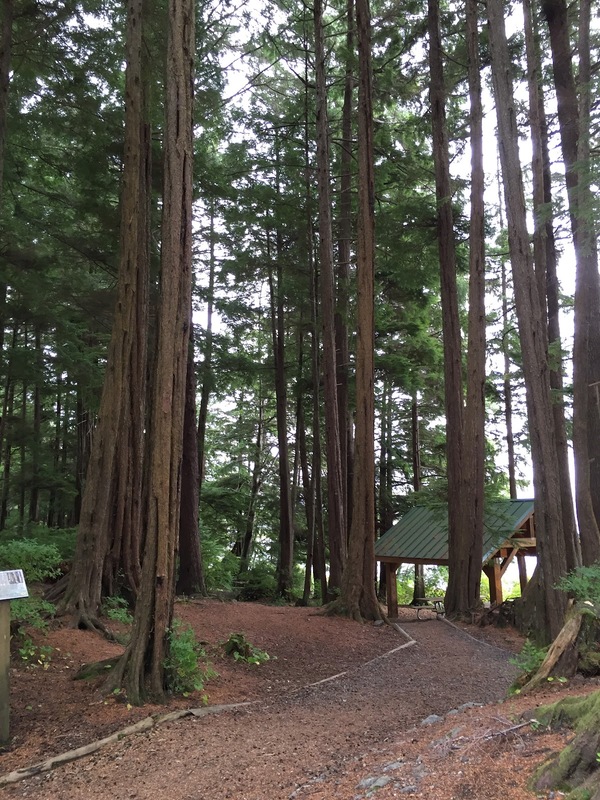 Interpretive signs educate visitors about the trees. A cooperative effort of the Alaska State Parks Advisory Board and the Tongass School of Arts and Sciences, a local charter school, the signage was researched and written competently by 5th and 6th graders, who also raised funds to pay for the project. 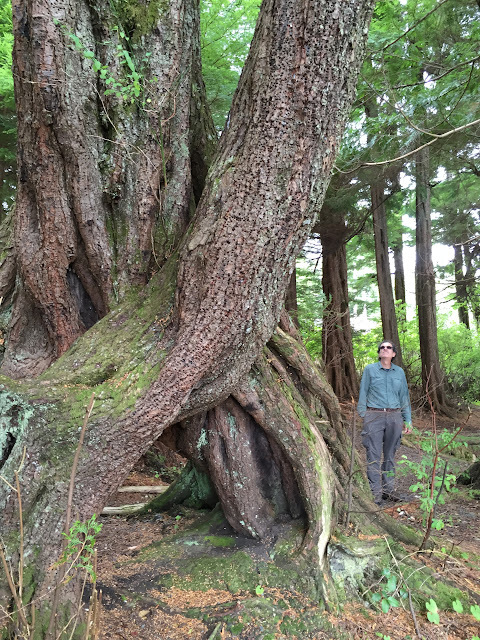 A stilted tree that began life growing on a rotted "nurse log." Roots are exposed when log decays. Continuing north on our drive up Tongass Highway, we reached Totem Bight State Park, an Alaska DNR facility which is heavily promoted and for good reason. Totem poles tell stories which are handed down from one generation to the next. However, in this area in the early 1900s, this chain began to be broken. The growth of non-Native settlements and decline of the barter economy led to a migration of Native Alaskans to communities near the white settlements where work was available. Forests soon grew over the villages they had abandoned, and weather deteriorated the totems left behind. The type of small totems on the right and left were used as grave markers. In the late 1930s, a CCC project was implemented to hire skilled carvers to repair or duplicate the totems which had languished. 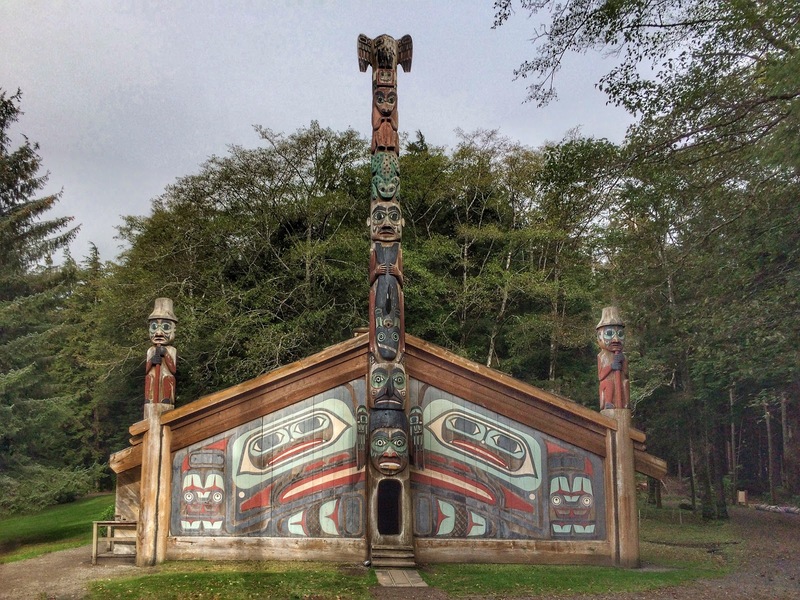 A model Native village was built to display and preserve the newly carved totems. A community house, or clan house, of the type built in the early 19th century was included in the village. Clan houses served as living quarters for members of an extended family. 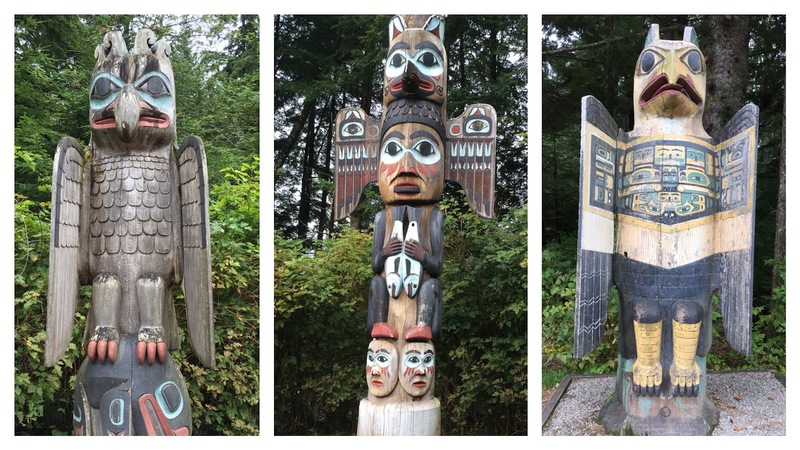 Leaving the totem village, we continued on our quest to drive to the end of the road. The distance from the extreme points on the south and north ends of the road is only 27 miles, and we needed to justify our car rental somehow. 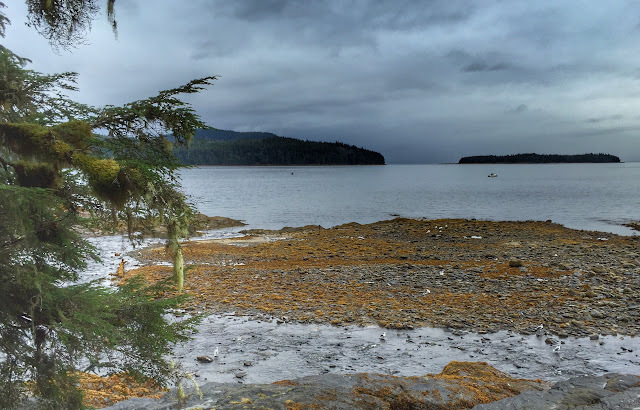 At the northern terminus of the coastal Tongass Highway, we found Settlers Cove State Recreation Site, another temperate rainforest nestled in a cove. Like the grove in Refuge Cove, this stand of forest boasted sizable specimens of Red Cedar, Sitka Spruce and Western Hemlock, many draped in cattail moss. Following a sign leading to an overlook over Lunch Falls, we heard a raucous racket from an area along the shore. Tracking the noise, we came to a rocky beach along Clover Passage where a shallow inlet was thronging with seagulls excited about the teeming waters choked with spawning pink salmon. The gulls dipped their heads under intermittently to feast on salmon eggs. If you're not familiar with how this remarkable reproduction occurs, as we were not, a Santa Barbara marine science professor has an excellent explanation on her web site. At the bottom of the photo, what looks like rocks in the very shallow water is actually salmon. Marveling at our good fortune to stumble upon such a sight, we backtracked to the Lunch Falls trail and checked out the chilly cascade, where salmon were also present, though in smaller numbers. 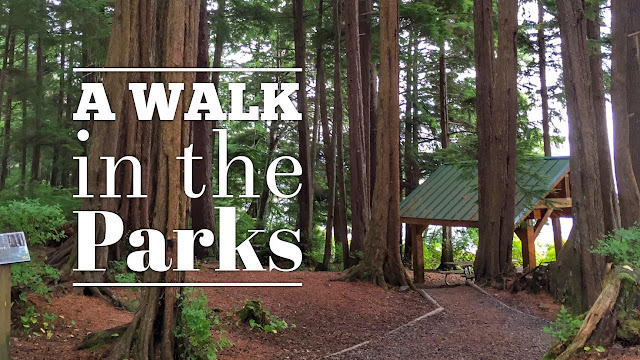 The well developed trail system winds through the rainforest along a gravel path leading to boardwalks overlooking the creek. 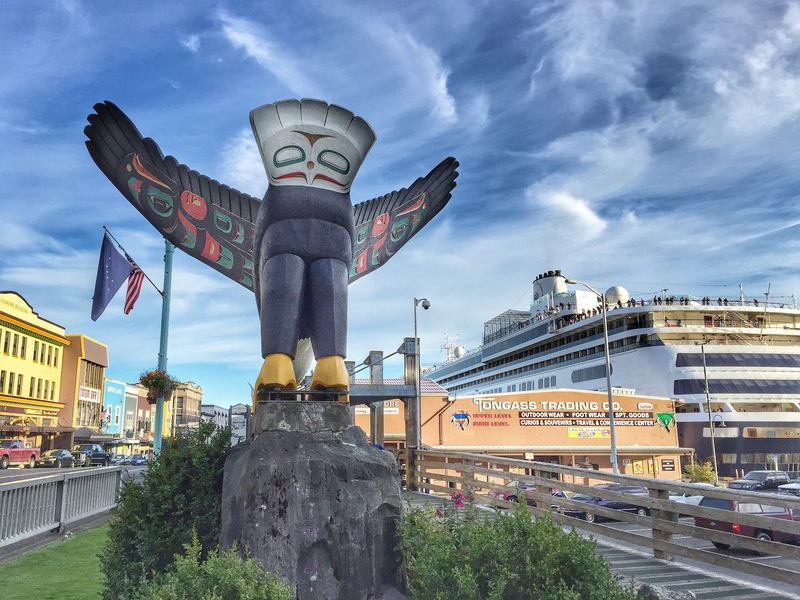 We spent two nights in Ketchikan and actually enjoyed some rare blue skies the evening we arrived and the morning we departed. In addition to the outstanding small parks described above, we also found several letterboxes planted by some of the many tourists who sail into the town, and we left one of our own. A couple of boxes that we didn't find still took us on trails so enchanting our failure to locate the hidden treasure seem all but irrelevant. 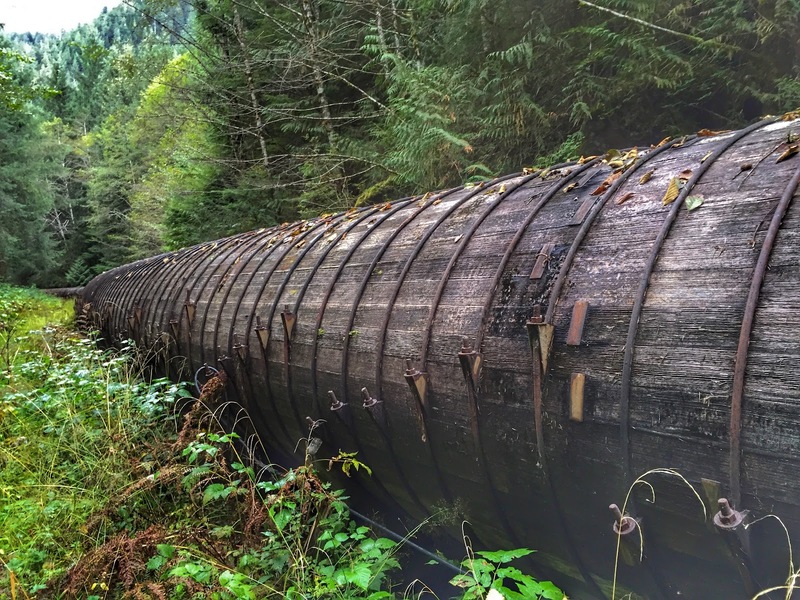 Pipeline Trail runs along an old wooden pipeline. After two nights in this interesting town, it's time for us to move on. Tomorrow we'll take the ferry back to the airport, turn in our rental car and hop a 10 a.m. Alaska Airlines flight to Wrangell, 82 miles away. 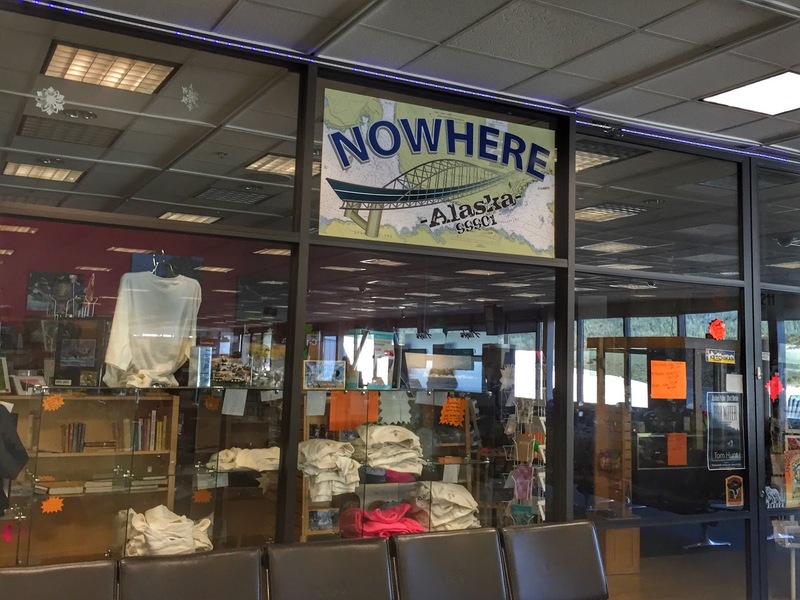 Ketchikan's airport gift shop capitalizes on the Bridge to Nowhere notoriety.